Yaye!!!!!! Hello good people :-D And in an exciting twist, we just sealed our collaboration with Access Bank to run the Basic Fashion Course for Juniors (ages 9-16) this year!!! Whoop! Whoop! So yes! This year, our young fashionistas will not only learn about fashion and how to sew, they will also learn about financial management and the value of money in fun games facilitated by the Children's Banking Unit of Access Bank! I can tell you it will be really exciting. I tell you, even we the adults need these lessons. And there is no better time to train our leaders of tomorrow about the value of money and hard work than today! Okies! So let me quickly tell you about the Course! 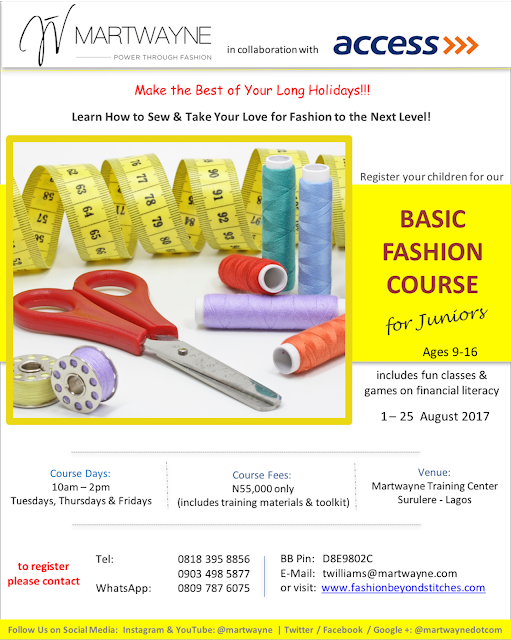 So the Basic Fashion Course for Juniors is for young children ages 9-16 (though if your child is 8, we can also accommodate them). If your child loves fashion and you can already see in them that they have a talent, now is the time to help them nurture their inner creativity and develop budding entrepreneurs for the future! Fashion is fun and children love to be able to create things. So why not send them over to us during the long holidays so you don't have to worry about them being bored at home doing nothing! If you have been following this blog, I am sure you must have seen this picture in the past! This was definitely one of my proudest moments as a teacher. It is always fulfilling teaching complete beginners how to develop their skills from scratch but even more fulfilling when an 11 year old does this for you! All from scratch! From measurements, to patterns, and to the final garment which you can clearly tell that I thoroughly loved! AND I still rock this skirt till today! And she was not the only one! Last, one of our participants last year, also created this for her mom who wore it to work and also embellished some tops for herself and her baby sister. You can tell she is a very proud mother from her Instagram post! So the kids do learn a lot and also have a lot of fun in the process. Too much fun! Okay so what will they learn you ask? - AND the grand finale will be for them to recreate the same things for their parents! ALL in a completely supervised environment! To get a full picture of what the Course entails, click on this link to watch me talking about the Course live on Facebook and 98.9 Kiss FM Lagos a few weeks ago. You can either click on the link below or the video itself. 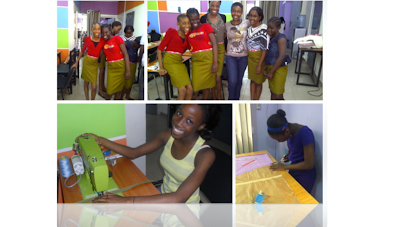 The fees for the Course are N55,000 which includes their sewing kit as well and other things they need for the Course. This will also get registered as members of the Early Savers Club for free (subject to the parent's consent of course) championed by Access Bank! "To help today’s children avoid a future of financial worries, it is important that they are taught money management early in life. The Early Savers Club is a financial literacy club for children in schools, faith based organizations and other suitable clusters for children. The objective of the club is to teach children about money, importance of savings, spending smart, planning for the future and the value of giving in a fun and interactive way." So parents... really you have nothing to lose these holidays! It starts on the 1st of August, 2017 and runs throughout the month! Classes are on Tuesdays, Thursdays and Fridays from 10am to 2pm. Registration is on! Please feel free to visit us before the day to check out the environment to be sure we are genuine and I can guarantee you we are as you can see from the pictures. Okies! That's about it! So register your children early!!! It starts in about 2 weeks. You cannot register on the day because we will have no materials for them. Please please please register them early. Please do not procrastinate! Let's make this a fun one for the kids these holidays. The more the merrier! Keep them engaged over the long summer holidays and you will be glad you did! If you have questions, please contact us on 0818 395 8856, 0903 498 5877; WhatsApp: 0809 787 075; Blackberry: D8E9802C or email: twilliams@martwayne.com.